Your little boy or girl will have a blast putting this Birthday Puzzle together. Seeing their name when the project is finished will be a moment they are sure to never forget. 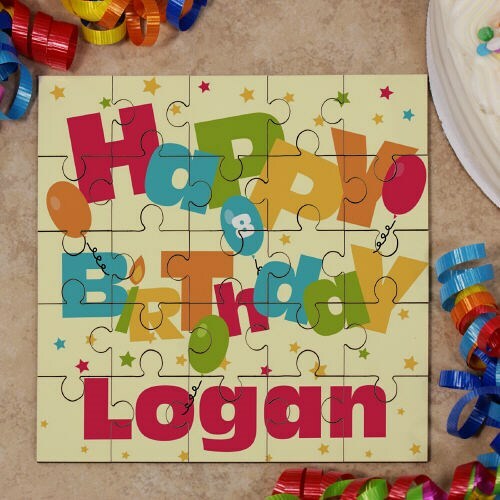 Our Happy Birthday Personalized Puzzle is available on our premium wooden 25 piece square shaped jig saw puzzle, measuring approx. 6.7" w. Each Custom Printed Jigsaw Puzzle comes assembled in a clear plastic box, great for storage. Includes FREE Personalization! Personalize your Happy Birthday Square Shaped Wood Jig Saw Puzzle with any name and any age. Additional Details A birthday celebration is a fun time for all! Make this moment more memorable with Personalized Birthday Teddy Bears from 800Bear.com. Be sure to also had our Engraved Birthday Picture Frame to capture any special birthday moments.